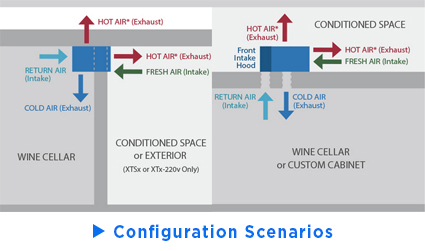 CellarPro 1800XT cooling units (1/5 Ton Nominal) are suitable for small wine cellars (up to 250 cubic feet), commercial applications and wine cabinets located in garages (in temperatures ranging from 50-95F). Performance testing shows that this compact unit maintains optimal cellar temperature and humidity conditions more effectively than similar units from competing brands. 1800XT units also are significantly quieter than comparable units from other brands. Visit our Learning Center for data tables, performance charts and product comparisons among different brands. CellarPro 1800XT units are sized to replace Breezaire 2200 and Wine-Mate 2500 cooling units. Please confirm equivalent dimensions and airflow prior to purchase. CellarPro 1800XT Cooling Unit (P/N 1086). CellarPro engineered the 1800XT cooling unit for spaces that need extra BTUH and cooling capacity because of warm environments and/or the demands of a commercial establishment. 1800XT units are more powerful than CellarPro 1800QTL and 1800QT units, but also somewhat louder. All air-cooled refrigeration equipment requires fresh air intake to dissipate the heat generated by the cooling unit. The fresh air intake CANNOT come from the wine cellar space - it must come from space outside the cellar. Designed for indoor use only, 1800XT units can operate in environments ranging from 95F to 40F out of the box. To operate the unit in colder temperatures, please see modifications listed on the Options & Upgrades tab. The 1800XT requires fresh air intake at the rear of the cooling unit. If sufficient space does not exist to provide sufficient airflow to the rear of the cooling unit, you may need a rear duct kit. I purchased a new unit on-line to replace an existing worn out one. Received it, installed, but it appeared to have an internal electrical issue which caused the unit to shut off for no reason. A call to Cellar PRO's customer service and a few emails later a replacement was on it's way. The new one works great, just as expected. Thanks customer service! This is my second wine cooler from this company. Super easy to work with and very helpful getting me back up and running. My original unit lasted over 10 years. Happy customer. This unit replaces a Wine Mate chiller that came with the 400 bottle cellar. During a recent hot spell in Hawaii, the Wine Mate simply could not keep up with the ambient temperature. It ran continuously for over 3 weeks and could not get the cellar temperature below 72 degrees, which is really bad. Waited for the Cellar Pro since they were back logged on orders, and installed the unit the day after it arrived. It was a little difficult to install as it is quite a bit heavier than the Wine Mate and Breezaire chillers. Finally got it in and started it up. Chilled the cellar down to 62 degrees within a few hours, something that the Wine Mate had failed to do over 3 weeks. It is a really good unit, and hopefully will continue to run well when the ambient temperature in Hawaii rises once again, which is quite often now with global warming. My only complaint is that the unit runs pretty loud being that the cellar in in our living room. Wish it was quieter like the Wine Mate and Breezaire, but hey, those units couldn't handle the ambient heat. All in all, a great chiller. This is our 2nd cooling unit in a large Le Cache (5800) wine cellar. The first one was just replaced after 9 1/2 years in service. Installation was easy and we’re back up and running again. Only small concern is that it is just slightly louder running. My CellarPro 1800XT Cooling Unit was installed last week, right after I received it. It cooled the room right down. I have been monitoring it and it hovers between 58 and 60 degrees. Love the unit!! My old 1800T worked fine, but compressor failed 2 months after the warranty ended, yuch. The replacement appears to be working well; I hope it lasts longer. The unit was not operating under stress, about 12 hours/day. The replacement unit is quieter. Great product, great staff for ordering. Also clear instructions on installing. I have a Le Cache wine cabinet and have utilized two breezeaire units and with my recent purchase two cellarpro 1800XT units. My previous breezeaire units lasted an average of 8 years each. My first Cellar Pro exactly 5 years and two months. Upon its very timely failure just out of warranty, I called and was offered to return for troubleshooting or purchasing new. Given 500 bottles worth more than the cost of a unit, opted to purchase a new one. Unfortunately they did not have any in stock and one needed to be manufactured (Around the time of 2017 fires). Despite this I received it in California within a weeks time. Luckily I have another wine cellar I could move the stock to for the week (not fun). My suggestion to Cellar Pro Management would be to maintain a ready to ship unit at all times to ensure turnaround time is minimized to a day. I can only hope the latest 1800xt will last longer than 5 years. I was told some engineering changes were made that should help longevity, time will tell. The cost of replacing the unit every 5 years would equate to $250 per annum. Coincidentally the same cost as renting an offsite wine storage locker...hmmmm. As far as the working unit is concerned it did a fine job and the alarm was what caused me to investigate the source and found internal temp was 76 degrees, a wine saving feature, that alarm. would love to see a wireless connectivity feature that could relay internal temperature on a periodic basis and incorporate email or text messaging for alarm conditions. My home solar system does just that. I purchased the 1800XT to replace my Cellar Pro 1800 that was 8 years old. I called Cellar Pro to ensure that I was ordering the correct replacement unit and to ask some additional questions. The gentleman at Cellar Pro was very professional and very helpful. I placed my order with him and the unit was delivered as promised. Installation was straight forward and the unit works perfectly. I purchased this unit after my Wine-Mate 2500 stopped working. The main reason I chose the Cellarpro 1800XT was the operating temperature. This the unit can work in an area up to 95 degrees, 10 degrees more than the Wine-Mate. My old Wine-Mate simply could not keep up on on days when the outside temperature went above 90 degrees. It would run nearly constantly and simply heat up the garage. Over this last weekend, San Jose hit 108 degrees. My garage was at 91 and the CellarPro was not even running. It worked perfectly. Also this unit is dramatically quieter than the Wine-Mate. Wonderful cooling unit. Great price. I am contractor that build cellars and have used others at a much greater expense that don't last as long. The shortest duration of one unit was 9.5 years! Worth every cent. I needed a new cooling unit to replace a 16 year old Breezaire that finally gave up the ghost. I selected the CellarPro 1800xt based on the reviews and the dimensions are an exact match for my Breezaire. Bryan, the customer service rep was knowledgeable about the products, answered all questions, and got me the unit in two days. The unit was easy to install, the documentation is very complete, and I was able to get up and running within an hour. I had a vinotemp for 5-6 years and I was great till I needed something. After 8-9 calls to the factory and a dozen or more to there 3rd party service provider I though I had it figured out. I had to call every local service shop they had and all but 1 said they wouldn't work on it (cause they don't like dealing with vinotemp). Once I drove across town the guy said I would cost more to fix then a new one. So now I'm back to square one, it's been 2+ weeks of a busted chiller and I still need an one. I searched for a good price and found one on Amazon, sold by Amazon, but thought the factory would want to beat the price and deal direct. She last took my number and said she'd call back, never did. Next day the listing on Amazon was taken down. I will never buy another product from vinotemp, run around and bad rep seems to be they business. Cellarpro actual answers their phones, knows about their product, and freely shares detailed information their product. The units are well sorted, inside out side power cable options as well as venting options. I highly recommend cellarpro to anyone considering the switch. Glad to have found a quick replacement for my failed WineMate unit. The 1800XT fit excatly and works flawlessly. Now to the criticism. CellarPro does not list a location on their website. I needed the unit ASAP as mine failed during a 100°+ heat wave. The website clained feee shipping but when I went to check out the free shipping was ground, would process in 3-4 days and take however long it takes to get from them to me. I obviously could not wait that long so I opted for Next Day Shipping. That evening I receive a shipping notice from FedEx showing the unit on its way coming from Petaluma CA which is 30 minutes South of me. I could have driven to CellarPro and picked up the unit the same day I ordered it and not paid $141 shipping. Or even opted for free shipping and still had it as soon as the overnight option. All for an omission from your website. I sent CellarPro an email explaining this and my frustration over it. Never got a return email, phone call, letter in the mail... nothing. Unit is great, customer service/communication could use some help. The Cellarpro rep was very knowledgeable /professional and responded promptly to my Cooling Unit needs. I received the unit within a couple of days and the Unit works great. Would purchase another one if needed. The unit I had was a Winemate and I could not get a service rep from that firm to return my call. I found Cellar Pro and thank goodness I did. My sales guy was exceptionally knowledgeable about the product I needed and spent a good deal of time with me on the phone asking questions to make sure he recommended the right unit. He also provided great advice on how to install the unit. I purchased the unit over the phone and it was delivered right away. I could not be happier. My wine cabinet is maintaing perfect temp and the unit is very quiet. Cellarpro is the way to go! Bought both the Build 800 and a Cellar Pro 1800 XT for another unit. Installed as an upgrade to a 18 year old Vintotechque 450 bottle unit. fit into the existing unit but it is helped to have the little hanger clips from the old unit. I am a licensed Handyman and I've built three "Wine Walls/Closet" for my customers. I just built a refrigerated wine closet from an existing wine closet for a customer. I had to dismantle all the racks in remove all the wood facnigns to get at the bones of the old closet. The "new" area was properly sealed, waterproofed and insulated and the original wood liner and racks were reinstalled. The hole was cut and framed for the chiller. I submitted all my dimensions, glass area, and insulation factors to CellarPro. I chose a unit. I got a nice email back from CellarPro letting me know I probably chose the wrong unit. I had guessed from memory (faulty memory) at the closet size and the glass area. I re-measured t he next morning and called CellarPro to confirm and to help me calculate what unit I Needed. The new calc with the "real" sizes showed I ordered correctly, but the unit was on the "edge" for cooling capacity. CellarPro advised me that for the same $ I could go to the next larger unit. They would not let me make a mistake - my customer is a "snowbird" and returned to see their new, refrigerated wine closet. They loved it and are so very happy. Outstanding response and thank you for standing by your product. I highly recommend the 1800XT. It has been extremely reliable and has cooled our wine cellar perfectly. We had a problem with our unit not cooling after 3 years of use and Cellar Pro's customer service has done everything to insure that our problem is solved. I only wish the return shipping was paid for with a return shipping label. I bought the 1800XT in March 2015 after considerable research. I replaced a cheap Chinese unit that failed after a year--then the seller sent me a new one that failed after a year! So I was skeptical of everything. But this unit is doing fine. I have a closet that I insulated A LOT. It is about 120 cu ft. It holds about 40 cases and I keep it quite full. The CellarPro has done everything that they said it would. It cooled the space down very quickly, almost with no condensation. I never get water. It runs reasonably quiet in my installation (all interior walls, and around the corner from the living room and down a little hall. It vents into the laundry room which is on the next room (away from the living room). It might be rather distracting if it vented into a living room. But down the hall is fine--not too loud. It keeps the temperature perfectly between 56 and 60. It seems to be on about 1/4 of the time. That does not seem to vary with the outside temperature. It is still running strong--much more air flow than the old Chinese one. I vacuum the back fins monthly. I will continue keep posting progress reviews at least yearly, because longevity is important PS I also was pleased to be able to talk to very knowledgeable people directly at CellarPro. So glad we chose Cellar Pro! Our last wine cooler box, a whisper Kool, died suddenly after only 2 years of use. So we had a contractor friend ask around about other coolers. Cellar pro 1800XT came highly recommended but we did our own research anyway and found that other folks agreed that this was the unit to get. Our basement gets hot both more in the winter than summer, so we need a unit that can operate at higher than normal temps. It is much quieter than our old whisper Kool. We also purchased the filter that attaches by magnetized strip to the back since it is just above my workbench and dust is can be an issue on rare occasions. All in all we like it very much and found it to be well worth the the price tag, so far. I installed my Cellar Pro 1800XT about a month ago. It runs cool, and the fan moves a lot of air. It is pretty quiet, but I am glad it is down the hall and venting into a room away from the living room. It is running about 1/4 of the time, and I am very happy. I ran through three cheap Chinese coolers. No good--they do not last much over the one year warranty, Fortunately the seller heavily discounted the replacements, but after the third on I gave up. I will try to remember to re-review this unit at the end of each year I own it. It seems to be a very good unit. DO get the clips for mounting! Unit is running in a hot garage and keeping the wine at a cool temp. I do not have a bottle probe so I am unsure if the wine is cooled to the exact temperature, but by feel the bottle seem to be properly chilled. I would recommend this model for the above stated environment and I intend to order the bottle probe. Changed from Breezair as had 2 go out. Easy to install and so far works OK. Used my probe from old unit so I hope it's OK. I am on my third Cellarpro cooling unit in six years. I recommended La Cache to a friend before my first cooling unit went out and his proceeded to fail after two years. If you plan on cellaring wine for longer than two years I would strongly discourage buying this product. I bought this unit from IWA which I caution anyone from doing business with unless you thrive on frustration. They are located two hours from my house and it took 7 days to receive the unit during a 100 degree heat spell. Dane, we're very sorry for the trouble that you've experienced. According to our records, you reported problems on Thursday 8/27, and we shipped the replacement unit to you on Friday 8/28 for delivery on Saturday 8/29. Unfortunately, FedEx could not deliver the package to you because no one was home to sign for the package. This is FedEx's policy, not ours - signatures are required for orders valued above $500. If the wine cabinet is located in your garage, it was not designed to handle 100 degree temperatures. We'd be happy to diagnose the failed unit at no charge to see what caused the failure. i have an old school Vinotemp with a dead breezaire. The 1800XT was a perfect fit to replace the Breezaire, and after we read the directions (haha), it installed easily. So far, very very happy. I have had the unit 2 years and the cooling unit is out. The warranty doesn't extend when you replace the cooling unit so this will be expensive to maintain. Also, CellarPro dings you for over $500 until you send back the old unit and you have to pay for shipping which is ridiculous. So much for a good warranty! Buyer beware. We are very sorry that your unit died after 2 years, and will ship your replacement unit asap. We charge a deposit to ensure that we receive back the original unit, and will refund the deposit upon the return of the original unit. Just installed a CellarPro 1800XT in my 900 bottle walk in wine cellar to replace a Breezaire2200 which finally gave out after 15 years. Installation was easy (thanks to the muscles of my 22 year old grandson). Instructions were clear and easy to follow. Turned it on after 24 hours and two days later in was cycling on and off as expected. Cellar had about 150 bottles of wine in it, and the general ambient temperature in my lower level is about 81 degrees. I am most happy with the unit. It is much quieter that the old Breezaire and for some reason - I am not a physicist - it does not generate as much exhaust heat as the old unit. Would recommend the 1800XT for anyone who needs a replacement unit for a walk in cellar. Bought this unit to replace a Breezaire unit in a Vinotemp Wine cellar (closet type) - about 120 bottles. The compressor in this unit is extremely noisy -much louder than the unit it replaced. It has a loud "whine" almost siren effect, especially when the compressor first starts up. We can hear the compressor from other rooms in our house over 60ft away. It is much louder than any full size refrigerator I have ever owned. Also, the power cord exit from the back of this unit required modifications to be made to the wine cellar. The Breezaire power cord exited from the bottom of the unit so it could be plugged into an outlet inside the wine cellar. Because this unit is almost $200 more than the Breezaire unit and is advertised as a replacement, this is extremely disappointing. I was expecting much better. We believe that the cord-out-the-back is the preferred approach, which overwhelmingly is what our customers prefer, but we offer a power cord modification to allow the cord to exit from the front as an upgrade for customers who want this configuration. If you purchased your cooling unit within the last 30 days, please contact us and we'll be glad to arrange for an exchange of your cooling unit to the 1800QTL. Just replaced my 15 year old Breezeair WKB2000 in my Le Cache cabinet with the 1800XT....handled the install myself without any issue. The 1800XT weighs about twice as much as the old BZA, but with a little heave ho, I was able to get it up into the back wall opening and supported it with some cardboard over the top of the wood racking. Needed to remove/replace the front metal cover to get the clips in place, but that was short and easy to do. The 1800 fits well into the space where the old BZA was mounted, but there are some gaps that need to be filled with the enclosed butyl tape. There was just enough tape to go completely around the back of the unit to get the required seal. Fired it up after letting it settle overnight and it began to cycle without a hitch. As some have reported, the noise level is noticeable, as our cabinet is in a room off of our kitchen. My wife says it is much louder than the BZA it replaced. I didn't want to step down to the QT model, since our cabinet holds 550 bottles and I wanted to have the extra cooling power of the XT. Its only been a couple of weeks, so I don't have any long term experience yet, but so far, so good. Purchased to replace old Breezaire. Helpful telephone sales rep. Delivery was prompt and unit was easily installed and activated. It is a big improvement - I really like the digital display. We have been in a bit of a heat wave and the unit is working perfectly. So far, excellent. The CellarPro 1800 XT arrived on time and well packed. i removed the unit and let it sit for 24 hours as directed in the installation instructions. I then plugged the unit in to test it for proper operation, fans, cooling etc. I had to make the rear opening of my wine cellar larger , since the EW 800 (the original cooler) is a smaller unit , but that was not a big job. While i had my wine out of the cellar i took this time to also re-calk all the seams from inside and out to insure a good seal. Once the unit was installed and properly sealed (with sealing putty included with the unit) i plugged it in and it began to cool my cellar immediately , much quicker than the original cooler. Per the instructions i put my cooler into its "quick chilling" mode several times to get the bottles cooler quicker since they had been sitting out for 6 or 7 hours while i was performing this installation. This cooling unit is now cycling on and off much less often than the original unit, it is quieter as well. i also want to mention before purchasing this unit i called the 800 number and got very good advise as to which unit i should purchase for my needs and I purchased the extended warranty for five years , its is a good value should i need to have this unit repaired in the next five years. I have only had this unit for a few days but feel it will be a great asset to protecting my wine investment since the company seems to very professional in every aspect of its dealings. I purchase the CellarPro 1800XT to replace the BreezeAire unit in my wine closet that sits in the garage. I chose the CellarPro because it was produced near where I live in northern California and the information on their website was compelling. Shortly after the installation, I noticed that when the ambient temperature of the garage reaches 82 degrees, the condenser alarm sounds. Following a number of calls to their tech staff, the installation of an air deflector and the resetting of the resetting of both the Minimum Set Point to 60 degrees as well as increasing the FON setting as instructed in the manual's trouble shooting section, I've had to disconnect the alarm setting. A big disappointment that this has happened and I would not recommend the CellarPro. I have another wine closet sitting right next to this one that I've had for 15 years cooled by a Cell Master unit which has never given me a lick of trouble. In hindsight, I should have replaced my BreezeAir with the Cellar Master. I suggest that you do the same. Because the customer is located in the Bay area, we were able to visit the customer's home. Upon nspection, we noted that the rear-vented cooling unit is recessed in the rear wall of the cabinet, with Vinotemp's original grill covering the opening. This condition was causing the unit's hot air exhaust to be trapped and re-circulated by the cooling unit, thereby causing compressor to overheat. When we removed the grill from the back, it improved the airflow and hopefully will resolve the problem; otherwise, the cooling unit will need to be installed flush or proud on the rear wall of the cabinet. I am generally not a letter writer unless its bad news. In this case quite the opposite. I awoke the other morning to find my Breezaire had inverted and overnight became a heat pump. To add icing to the cake I was leaving for Sonoma that morning and then leaving later that week for an extended business trip. This would leave my sizable investment at risk of being ruined. Thanks to Brad's effort and the rest of the team I was able to get a replacement unit during my trip to Sonoma. This not only saved my wine, but my peace of mind. Brad did not have to hear my tale of woe, but did and the IWA team proved they could come through for me in record time. I am installing the cooling unit tomorrow and have every belief that I will be completely satisfied. btw - I had earlier asked for some technical answers when I first suspected that I might be losing my unit and although I do not know who replied, but they are the reason i called CellarPro first. Thanks for going the extra yard on all counts. It replaces a BreezeAire 2200. It was so quiet, I could not be sure it was on. I find the 3 minute delay to start when plugged in a little unsettling. I find it hard to set the temperature, but once set, it does not have to be done again. Read the directions! And buy the clips and the filter. My first 1800XT lasted 18 months and now I'm having to spend $100 in freight to get a replacement. The unit is installed in a cellar built exactly to the design done by Sonoma Wine Accessories where I bought the 1800XT. The unit has worked perfectly up until now when it suddenly stopped cooling. I hope that the second one lasts longer. Luckily it's winter and the weather is cool. Replaced and old winemate 2500, this unit looks better, is much quieter, and has a significantly better control panel. If cellarpro didn't gouge carging $10 for the mounting clips rating would have been 5 stars. I had to replace a failed cooling unit on my wine cellar and switched to the Cellar Pro 1800XT. I have two glass walls on my wine cellar and the old unit always struggled to keep up with the heat. The 1800XT was a breeze to install and does a great job. What was really impressive was how fast it cooled the cellar down. I am very pleased. I've had my wine cabinet for 15 years, so this was the second time I had to replace the cooling unit and this was a drop-in replacement. Easy to install and it's up and running! The customer service was great. My 1800xt arrived on time and runs great. It is more quiet then I expected. I would recommend this product. I have had my 750 bottle Wine cabinet for 12 years. I just replaced the cooling unit (Breeazaire) with CellarPro's own brand. It's by far superior. The employees were very helpful and professional. I highly recommend their product and service! The folks at CellarPro were great to deal with.... Unit arrived on time and was quite simple to install. And it's performing Great! Installing the unit was a breeze. I was worried that this would be a big project, but honestly, removing all the bottles of wine off the top rack to perform the changeout was the hardest part! It was very easy. The cooling unit had the cabinet at a perfect 59 degrees within a matter of hours. Great product and I'm very happy with it. The unit is certainly better than the Breezaire I had. However, I have never been able to get it down to 55 degrees. It clicks on and off every few minutes, and temp. stays around 60-62. It would be nice to be able adjust the temp. to whatever temp you want. The new unit arrived just before record breaking high temperatures came. So the installation in my garage was a real test. So far it has performed well. The installation was a bit tricky. The new grill on the front and the screws instead of rivits made the unit impossible to install from the back. I called service and they said that the front installation was easier anyway. With a bit of vasoline and some pushing, the new unit slowly moved into place. Even at 95 degrees, the unit is holding temperatures in a tight range, and is cycling "on" for a surprisingly short time. Just recieved my new 1800xt unit and went thru the simple startup procedure, installed the unit and it cooled my cellar down in 8 hours. I highly recommend this unit as a replacement or for a new cellar, it may cost you a few more buck up front but it is well worth it in the long run. I replaced the previous brand twice in four years before I learned my lesson. Thanks CellarPro its cool in Dallas. This unit is very quiet. Installation was easy, Great customer support answering questions before the order. I replaced a 5-1/2 yo Breezair 1060 that never really performed well. It is was spec'd to work for my 5200, especially in-doors. It struggled in hot humid weather and resulted in my having to raise the cellar's temperature to 62+, every summer. Then, it started failing even in cooler weather. I'm glad that I never upgraded to the noisy 2200, since they apparently had issues too. The 1800XT was an easy installation and I was done in about an hour. It hasn't been hot around here yet, but I can already tell that it will have no problem holding the temperature. The real test will come soon enough when our 6 months of 90+ weather and high humidity begins in a couple weeks. I replaced my existing Breezaire with the 1800XT. The lack of expected noise was a pleasant surprise and the airtemp stability is better than new. Easy to adjust to personal preference temp and humidity settings (really not necessary as the system is very adquate and ready to go right from the carton), this unit was just as advertised as a direct replacement for my Breezaire unit. I upsized by 40% as my cellar is in a very warm Southern California garage (where two daily driven automobiles share space). I followed directions to the letter, letting the unit sit for 24 hours and then bench running it for 1 hour to test the unit. Warning, the directions do not say to raise the unit when bench testing. Very necessary as otherwise one would block the return air. Just bought this unit. Initially, it kept on giving me an error message that the condensing coils were over heating. I realized that the exhaust of extremely hot air from the unit was coming out right next to the intake!. So, I installed a piece of cardboard to re-direct the air away from the intake, and now the unit is working quite well, keeping my 900 bottle walk-in wine cellar at 56 degrees. I bought this to replace the cooling unit that came with my Vinotemp which died after 3 years. What an improvement! This keeps the cabinet much cooler, and was SO easy to install. My only regret is that I didn't buy this in the first place. Recently purchased 2 1800 XT units as replacements for seven year old Breezaire 2200's in a free-standing 2500 bottle cellar. The units are much quieter than the Breezaires and do not run nearly as much to maintain the set 60 degrees. While more expensive than the Breezaire, these are definitely an up-grade and should result in energy savings as well. We recently purchased an 1800 XT as a replacement for the Breezaire 2200 unit for our European Country Model 5200 Wine Cabinet. (The Breezaire 2200 compressor quit after roughly five years of indoor use.) Some findings after a month of use: 1. The 1800 XT is much quieter than the Breezaire unit. 2. We love the humidity control of the 1800 XT, which is not available on the Breezaire. 3. We've noticed that the 1800 XT runs much less of the time than the Breezaire, indicating that it is putting out cooler air. "Replacement" that is better than the original! We recently bought the 1800 XT because our Breezeaire 2200 stopped working after 10-11 years. It was at least a couple of hundred dollars more expensive than the 2200, but well-worth it because a) it's a lot quieter than the 2200, and has more cooling capacity. We don't have air conditioning in our condo in San Francisco (who does?) and on those occassions when it nears 100 degrees, the 2200 was taxed and the temperature of the cellar rose more than I was comfortable with. The extra $200 is well spent insurance against hostile storage conditions. Also, the partners are supremely customer focused and knowledgeable. They accomodated delivering the unit to a partner's house in San Francisco, while I picked it up one morning. Unusual, and very much appreciated. If you're considering this unit, and have an application for it, I would highly recommend it. It's a well-built unit, quiet, and I have no doubt that the company backs up their products, should it ever need servicing. I have had the CellarPro 1800XT installed for about 4 months now. Initially it seemed to be running quite a bit. I called the company and one of the owners answered and gave me tons of advice. Wow. Talk about customer support. the unit was an exact fit for replacing my Breezaire 1060 - it simply slid perfectly into the opening in my 300 bottle cabinet. Its working perfectly and is much quieter than I expected. The writeup says the smaller unit is quieter but the 1800 is much quieter than the old Breezaire. The 1800XtT was a direct replacement for my Winemate. The installation was easy. Do buy the mounting clips. It's curious that they are offered as an option instead of just being included with your purchase. I'm mechanically inclined and I would not attempt installing the unit without them (not worth the hassle). The system cooled my 440 bottle cellar with glass doors that I had loaded with about 150 bottles in less than four hours. The digital display is easy to use and I have it set at 57 degrees. I store the unit in my garage and it's surprisingly quieter than I had expected. During the heat of the day it typically cycles on and off every fifteen minutes. I also purchased the optional air filter that magnetically attaches to the rear of the unit. The magnetic strips that hold the frame onto the unit hold, but barely. If you're looking for maximum longevity of the unit seems like cheap insurance to me. All in all I'm very pleased with the performance of the 1800XT. First the good. The unit is dramatically quieter than the Breezaire unit. It seems to be a little more efficient in that it runs a little less, but that may be because the Breezaire unit was losing refrigerant. The control panel is much more sophisticated than the Breezaire as well and the humidity in the cabinet is about 10 percent higher (which is good. The Breezaire maintained about 50 percent and I'm in Florida. Sixty is a much better number.) Now the bad. It is not a matter of removing one unit and replacing it with the new one, at least not in my cabinet. I've replaced Breezaire with Breezaire in the past and it was really just a matter of removing and replacing, then resealing to eliminate outside air entry into the cabinet. My cabinets are both Vinocraft units from around 1999. They both exhausted upward and also took in fresh air from the top, with a grill directing exhaust air to one side and intaking from the opposite side. The unit was hung from the top of the cabinet and the rear of the unit rested on the rear of the cabinet. First of all, the dimensions stated do not include the front grill. Also, with the configuration of that grill, it must be removed to obtain an air-tight seal between the top front of the unit and the top of the cabinet. This detracts from the appearance of the unit. Also, the clips that allow you to hang the unit are pretty flimsy, but they do work. However, the height of the clips is different from those on the Breezaire. That was corrected by building up the rear of the cabinet so that the new unit would sit at the proper level. Finally, the entire cabinet needs to be moved away from the rear wall at least 8 inches. Esthetically, this might be a problem for some. So, in conclusion, now that it's done, I'm very happy with the results. I'm disappointed that I have a large space behind the cabinet which I didn't have in the past. But someone sleeping in the next room won't be awakened by the rumble of the old Breezaire. And the humidity in the cabinet is better. Also, my first Breezaire units both lasted 11 years. One of the replacements lasted less than 3 and that’s unacceptable. The cost of repair (it wasn’t the compressor) is exorbitant and the only option offered is to send the unit in for refurbishment. What happens to the 700 bottles of wine in the cabinet while you’re waiting for the unit to be returned?